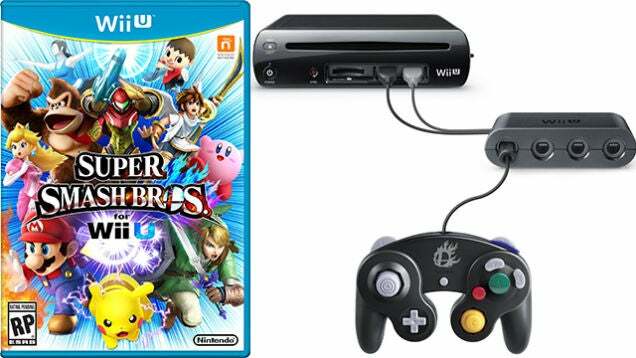 ‘Super Smash Bros’ Wii U Bundle Spotted, Is $99 Too Much? Hype over the October 3 release of Super Smash Bros. for the 3DS is out in full force, yet fans are anxious to find out more about the Wii U release of the game. The Wii U release date has not yet been revealed, but Amazon’s U.S. site has a pre-order listing for a Super Smash Bros. Wii U bundle, which comes with a GameCube controller, listed at $99.99. The pre-order date is set at the default placeholder of December 31, but some believe it will be released in time for the holidays. Making use of a GameCube controller has been on the fan’s wish list since Super Smash Bros. for the Wii U was announced, and it appears as though Nintendo is planning on granting the wishes. However, is the $99 price tag too much for the game, a USB controller, and the adapter to allow up to 4 players? The excitement surrounding the bundle is overwhelming, yet the price has received mixed reviews. Whiteblaze, a reader on Kotaku posted the following. However, reader m9105826 ignores the price altogether and praises the controller. Back in June, Nintendo pushed out a press release announcing that the GameCube Controller would sell for only $20, whereas the bundle would include a special GameCube controller that would equate to $30, the adapter, as well as the game. Unfortunately, the special controller is only special because it has the Super Smash Bros. logo printed on it. The press release shared that the bundle would be available for the holiday season. Nintendo fans are loyal fans, especially when it comes to Super Smash Bros. However, will they spend $99 to receive a controller with a logo on it, or will they opt for the $20 controller? It is inevitable that the bundle will sell out, but will you be on the list of those that obtain it?